According to latest estimates, over 100 million American adults are living with diabetes or “pre-diabetes” (that is, they’re on their way to developing it). On a global scale, around 415 million are living with it—that’s about 1 in 11 people around the world. And according to estimates, the number of people living with diabetes is projected to be 642 million (that’s 1 in 10 of us) by the year 2040. But did you realize that diabetes can affect cats and dogs as well as humans? This chronic illness can have serious impacts on the health, well-being, and longevity of your sweet feline—but fortunately, it can be managed well, especially with proper nutrition. What does a proper diabetic diet for kitties look like? If you have an animal in your home living with diabetes, this article is for you. We’re going to discuss feline diabetes, including what it is, how it manifests, and how you should feed your kitty if she’s living with this condition. We’re also going to talk all about diabetic cat food: what it is, why it’s important, and even how to feed your cat if she’s currently living with diabetes. We’ll also introduce a list of the best food for diabetic cat breeds so you’ll be able to feel more confident when it’s time to head to the pet store or surf the internet for your four-legged friend’s next best meal. Why Do Some Cats Get Diabetes? Can Diet Improve My Cat’s Diabetes? According to estimates, up to 2% of the domestic feline population has diabetes—although many pet experts believe the condition is actually under-diagnosed. Diabetes impairs the body’s ability to control blood sugar levels. It happens when the body becomes less sensitive to an important hormone called insulin. Among its many roles, insulin helps shuttle sugar from the blood into cells, so cells have energy to function. When insulin isn’t working well, sugar (which is broken down from carbohydrates in food) remains in the blood instead of getting moved into cells. This ultimately leads to elevated blood sugar levels. Unfortunately, there are a LOT of problems associated with chronically elevated levels of blood sugar. This includes excessive inflammation, nerve damage, an increased risk of infections, and even an early risk of death…NONE of which you want your kitty to have to deal with! It’s not entirely clear why certain cats get diabetes and others don’t. Like with humans, being overweight is a major risk factor. This is because extra adipose tissue, aka fat, increases inflammation and further impairs insulin sensitivity. What this means for pet parents is to watch portion control when feeding their animals! Kitties who are overfed—and who are given foods that are filled with sugar, chemicals, fillers, and garbage ingredients—are more likely to get diabetes. That said, genetics do play a role, so it may not be possible to completely eliminate a feline’s risk. Strangely enough, male cats (both neutered and un-neutered) appear to get diabetes more frequently than female cats do. Nobody’s really sure why. And some breeds, including Burmese cats, appear more likely to get diabetes than others (including non-pedigree/mixed breeds). The main signs of this condition include an excessive amount of thirst, hunger, and urination. Other more serious signs include vomiting, diarrhea, dehydration, depression, motor dysfunction and weakness, and poor skin and coat quality. In later and more advanced stages of the disease, a kitty may actually begin to lose weight, even if she’s still eating enough. This happens because her cells are literally “starved” of energy—they can’t get the nutrients they need to function, so your kitty begins to drop the pounds…but not in a healthy way. If you suspect your feline friend is showing signs of diabetes, or if you’re concerned about your weight, it’s extremely important to schedule a visit with your vet! If left untreated, feline diabetes can lead to serious and potentially fatal consequences. Yes! The right diet is actually one of the most important ways to manage diabetes in your feline and help control and improve blood sugar levels (we don’t want it too high OR too low). By the way: healthy nutrition is also one of the best ways to improve diabetes for humans, too. In addition to food, medications, exercise, and weight management can also improve your cat’s diabetes. This is why working closely with your veterinarian is so important. Let’s face it: your sweet kitty is a carnivore! Her ancestors evolved as exclusive meat eaters. And while all cats should get the bulk of their calories from protein, a protein-rich diet is especially important for a diabetic feline. This is because carbohydrates—one of the three main macronutrients (in addition to protein and fat)—is broken down by the body into sugar (called glucose when it’s in the blood), and it’s this sugar the diabetic kitty just can’t manage as well. In fact, a carbohydrate-rich diet may be the exact thing that caused your kitty’s diabetes to develop in the first place! So, the ideal nutrition plan for a kitty with diabetes is lower in carbs and higher in protein (and vitamin and mineral rich, too). If you end up getting wet can food, make sure the crude protein content comes in at 10% or more. Crude protein content in dry food should be about 40% or more. Meanwhile, total carb content should be no more than 7 to 15%. It probably won’t say this on the package, but you can figure it out by adding up all the other percentages (crude protein, crude fat, crude fiber, etc.) and then subtracting from 100. In addition to low-carbohydrate, high-protein foods, many cats with diabetes do best with low allergen foods. This is because diabetes can weaken an animal’s immune system, making her more susceptible to allergies. So, look for foods that use natural ingredients and are free from preservatives, artificial fillers, chemicals, and other additives. Interestingly, some pet owners have found that their kitties with diabetes do better with a fish-free diet. Why? Because many types of fish contain an amino acid that turns into histamine when exposed to air. Histamine is a compound released by cells in response to injury or allergic reaction and promotes inflammation. Your best bet is probably to stick with products containing real meat from animals like turkey, duck, lamb, chicken, venison, rabbit, and quail. As mentioned, it’s extremely important that she gets a low-carb, high-protein diet. This means the standard stuff on the shelves that’s highly commercialized and mass-marketed probably isn’t very good for her! Fortunately, quality diabetic cat food (5 of which we’ll review shortly) is available without a prescription. Feed her at the same times every day. Consistency is key to help her stabilize her blood sugar levels. If you give your kitty insulin, try feeding her right before you give a scheduled dose. This gives you the freedom to modify her dosage if she doesn’t end up eating all her food. And don’t worry if this sounds confusing—your vet should give you detailed information about how and when to give and adjust her insulin and any other medications. Minimize treats! They should be about 10% or less of her caloric intake. Aim to give treats at the same time every day, and stick with high-protein yummies like freeze-dried chicken. If she’s overweight, be sure to feed her in a way that will promote sustainable and healthy weight loss. A safe rate is up to 1% reduction of bodyweight per week, until they reach their goal weight. You’ll need to pay attention to portion sizes, so have your vet help you with this. Now we’re going to review the top 5 non-prescription food options for diabetic kitties. Before we do, though, keep in mind that if your animal has a chronic illness, it’s important to talk to your vet before switching out her food. After all, we know you want what’s best for her. But it’s important to make sure you introduce food changes slowly to avoid or minimize problems like gastrointestinal upset (which isn’t fun for her or you). Besides, depending on your kitty’s health, your vet may recommend a prescription diet in addition to prescription medications (though as you’ll see, a lot of over-the-counter diabetic kitty foods work just as well or even better than many prescription diets). All that said, let’s take a peek at the 5 diabetic-friendly cat food brands that made our list. These products proved to be the cat’s meow according to our research, based on ingredients, quality, price, and customer (and kitty) feedback. 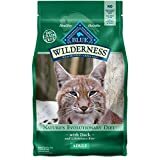 This product is a front runner for the best wet food for diabetic cat breeds. It’s grain-free, making it low-carb and less likely to induce inflammation—although this one does feature fish which, as we’ve seen, may be problematic for some kitties with food sensitivities. Fortunately, it does come in other flavors if fish doesn’t work for your feline. While at least one review felt that the amount of food in the can was wanting, most owners say there’s plenty and that their cats can’t get enough of it! Easy To Serve: Custom-Design, Upside-Down Can And Easy-Open Lid Make Mealtime Quick And Easy. This wet cat food from New Zealand is a very high quality product. It’s completely free of all the major additives you see on pet store shelves: no grains, corn, soy, rice, potatoes, wheat, fillers, sugars, glycerins, meat by-products, preservatives, guar gum, agar, BPA, or carrageenan. You want to know what’s even more impressive though? What this food does contain. Specifically, it’s made with 100% single-sourced, free range, ethically raised, grass-fed, and sustainable venison (that’s a mouthful!). The venison they use is free of antibiotics and added hormones…so you know your kitty is getting a very high quality type of protein. This can food also contains 3% of New Zealand green mussels which are a great source of chondroitin and glucosamine for healthy joints. This is important, since obesity and diabetes can increase the risk for arthritis. This dry food can absolutely work for animals with diabetes since it’s grain free and relatively low in carbs. It’s free of preservatives and made with nest-laid eggs, wild caught fish, and free-run poultry. One major problem experienced by several reviewers is that when the company switched from using a Canadian to an American manufacturer, the product seemed to change—and not in a good way. Many owners said their cats vomited and otherwise responded poorly to the new food, even though they were doing well with it for so many years before the switch. This dry cat food’s first ingredient is cage-free chicken. It’s made with high protein kibble as well as raw and freeze-dried bits of chicken for extra nutrition. This product also has a healthy amount of omega-3 fatty acids for healthy skin and coat, plus it contains antioxidant-rich veggies, fruits, and probiotics for improved overall health. Some users have asked questions about how to store it for freshness, with concerns about it going rancid. But as long as you keep it in an airtight container, it should be fine. This brand of cat food is well-respected and US-based. They pledge to use high-quality protein (with real meat as the first ingredient) and natural sources of fiber to maximize digestive health and nutrient absorption. Blue Buffalo also puts plenty of great omega-3 and omega-6 fatty acids in their food to encourage a healthier skin and coat, which we know can be affected by diabetes. Included in the kibble are so-called LifeSource Bits, which contain a potent blend of vitamins, minerals and antioxidants. 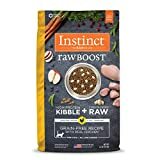 A few reviewers who own cats with diabetes have mentioned this food really seems to help control their animal’s blood sugar. The food is tasty (according to most kitties), and while some reviewers have found that their animals vomit after eating certain flavors, you do have several to choose from. Don’t let a diagnosis dishearten you: kitties living with diabetes CAN live long, happy, active lives. Want to help yours? Then give her high quality food, encourage daily play and exercise, and make sure she’s getting the right kind and dosage of the medication she needs. Hopefully, this review will help you feel confident about what you’re feeding your little furball—one major pillar of diabetes management. And if you ever have any questions, just remember that your vet is only one phone call away.